All grill manufacturers will tell you that their products are easy to assemble, easy to clean, and ready for quick shipment. But are those really the most important things to look for? Today's grill buyers expect quality, service, and satisfaction. However, there are important factors to consider before making that important purchase decision. Your grill needs to make money and be constructed for commercial use. Before you buy, there are five important things to consider. PLEASE NOTE: The following information is specific to carbon steel grills. Stainless steel grill properties are significantly different. 1. A Large Grill Size Equals the Quickest Way to Feed a Hungry Crowd! Temperature - Some items cook better at lower temperatures. Cooking Level - Is the finished product rare, medium or well done? Preparation - Are there marinades and rubs involved? Is the food raw to start? In the interest of time, many BBQers pre-cook ribs and chicken and simply finish them on the grill. Size - Extra size or thickness does play a part. Quality of Product - Is the meat lean, fatty or marbled? 2. Check the Gauge of the Steel Used to Build the Firebox. 12 gauge steel is 41% thicker and much stronger than 14 gauge steel. This makes your grill stronger and more durable. Don't be misled. When it comes to steel, bigger is not always better. The smaller the gauge, the thicker and stronger the steel. Make no mistake. Welded fireboxes are stronger and more durable than bolted fireboxes. The difference will become evident over time. All fireboxes can warp due to extreme heat, however, this is less likely to occur with welded fireboxes. In addition, multiple reinforcements on the underside will help to extend the life of the grill. The more reinforcement the better. For example: a 60" unit should have a minimum of three 2" wide steel reinforcements. Over time, a 12 gauge welded reinforced firebox will be less likely to warp from consistent commercial use. 3. More Heat is Not Necessarily Better!!! Most grills you'll look at will start up quickly and offer you plenty of heat. Unfortunately, the amount of BTUs that a unit offers does not offer the complete story. For example, a grill with 150,000 BTUs can reach temperatures of approximately 850 degrees, however, it is very unlikely that you will ever need to cook at a temperature higher than 500 degrees. Instead, your primary concern should be evenly distributed heat. A grill that distributes the heat evenly will prove to be a more effective means for cooking evenly and consistently. Keep in mind that many factors affect heat output. These factors can include wind conditions, grill maintenance, altitude, barometric pressure, and LP tank level. Individual burners with adjustable heat. This will allow you to control different areas of the grill. Lava rock is a good conduit of heat. The right amount arranged properly is the ideal formula. If the lava rocks are distributed unevenly the heat doesn't reach the food and the grill doesn't get as hot. Too few rocks can cause the heat to escape faster and cause uneven heating. An added benefit is that lava rock creates smoke that adds flavor to the food. For top performance and fuel conservation, a hood is recommended. Bottom line – Sensible, even, adjustable heat results in a better cooking experience. A grill that gets too hot uses more gas, ruins your food, and runs a greater risk of causing dangerous burns. 4. 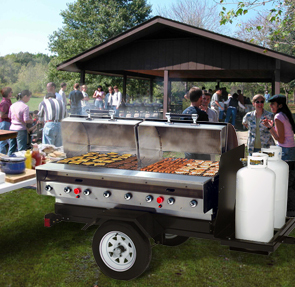 A Mobile, Portable, and Versatile Grill Equals More Profits! Production cooking is not always a stationary situation. it's very possible that you may have to transport your grill to another location in order to take advantage of a good business opportunity. Check with to make sure manufacturer you buy your grill from offers trailer-mounted models or a trailer to which your grill can be easily and safely mounted, even after you've owned it for a while. In addition, there may be multiple highly profitable opportunities that might require you to serve such unique dishes as roasted pig, lamb, and even steamship rounds. Be sure your grill can be easily fitted with the type of commercial rotisserie attachments these type of foods call for. 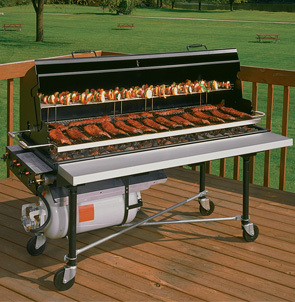 The ideal grill should be versatile enough to be trailer mounted with rotisserie attachments included. 5. Is Your Grill Safe? Insist on a Certified Grill! Certified grills are the exception – not the rule. Many are not manufactured under strict guidelines and may not hold up after regular, rigorous, commercial use. You may perceive the inferior non-certified grill as safe, but there are no assurances without the proper certification. Certification means the manufacturer cares enough to take the time and money to secure those certifications and to build a grill with the quality required to meet those higher standards – which is why most grill manufacturers don't do it. it's the familiar "pay now or pay later" scenario. Failure to protect both the products and their customers will have a future cost due to potential liabilities. The same holds true for you. Don't assume that every grill is certified to gas equipment safety standards. Ask if the grill is certified. Who certified the grill? Look for that agency's certification label on the grill unit. Reputable certifying agencies such as UL, Intertek Testing, NSF, and CSA insist that their label be on the grill in plain sight – or the certification is not valid. This certification may help you avoid an unfortunate accident, help you to obtain Fire Marshal approval, and possibly meet certain local cooking codes. The Bottom Line: You need to concern yourself with feeding large crowds as quickly as possible, not worrying about safety and liability issues. Proper certifications provide the peace of mind that comes with knowing that the gas grill you bought was manufactured to the highest standards of safety.